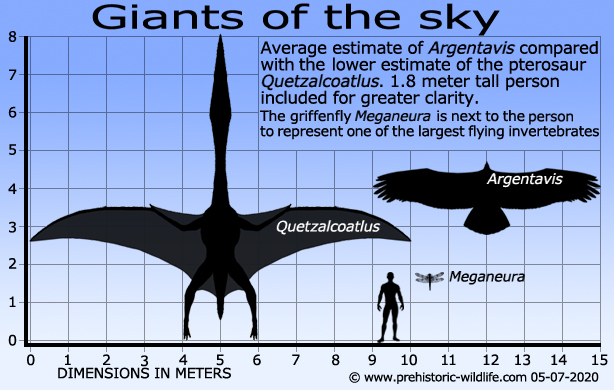 Argentina Discovery - Argentavis is the largest flying bird ever discovered. 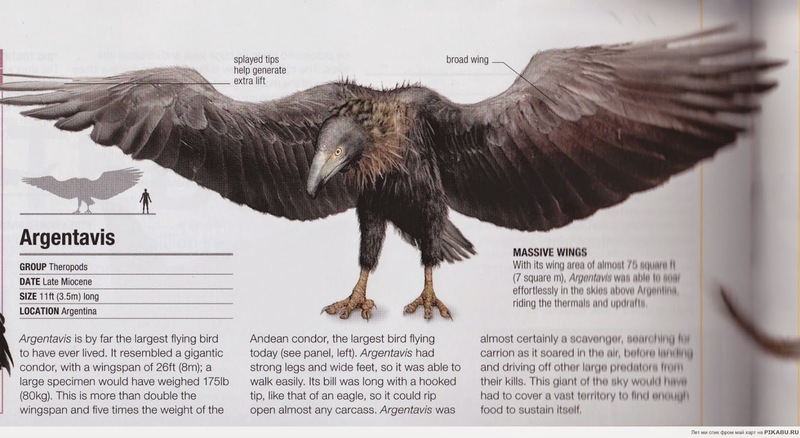 It’s most likely that as a result of these under developed muscles Argentavis relied upon prevailing wind currents to keep itself aloft with flapping only occurring during the take-off and landing phases.‭ ‬This would see Argentavis using its large wings to exploit a combination of thermal up draughts‭ ‬as well as dynamic soaring.‭ ‬Dynamic soaring is essentially where a flying creature uses the boundary between two air masses to pick up speed by cartwheeling into oncoming wind and using the wind speed to accelerate itself forward.‭ ‬Repeating this process further increases the speed of the bird and resulting effect of the next manoeuvre resulting in an extremely energy efficient form of flight,‭ ‬one that is now even used by human glider pilots to stay airborne longer. Feeding behaviour for Argentavis has been hard to ascertain,‭ ‬but it is thought to at least be a carnivore.‭ ‬Argentavis is not thought to have been an active predator however due to its body shape and comparatively weak breast muscles.‭ ‬A much more believable behaviour for Argentavis would be that of a scavenger,‭ ‬perhaps similar to an Andean Condor‭ (‬Vultur gryphus‭)‬,‭ ‬a bird thought to possibly be the most similar living bird to Argentavis but less than half its size.‭ ‬Scavenging would also require little in the way of active movement,‭ ‬reducing the required number of calories to keep its body going. 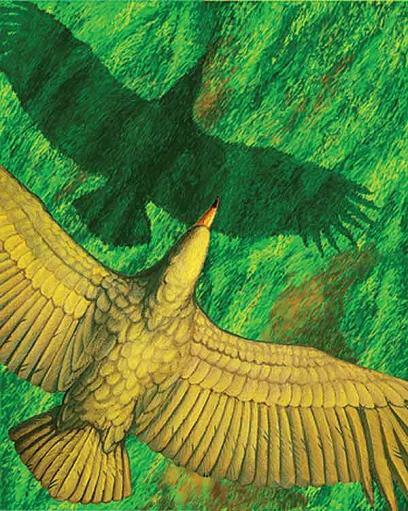 The huge size of Argentavis meant that it would have had little trouble in driving off smaller mammalian predators like Thylacosmilus away from its kills.‭ ‬However it should be remembered that the top predators of Miocene South America were actually another group of birds,‭ ‬the ground dwelling phorusrhacids‭ (‬better known as‭ ‘‬terror birds‭’)‬.‭ ‬These birds had lost the ability to fly but the largest members of the group such as Phorusrhacos and Kelenken were easily able to take down large prey.‭ ‬It may have been these predators that provided large amounts of carrion that supported Argentavis’s scavenging. 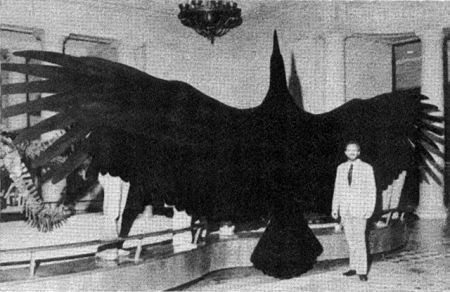 While no one can say for certain how long Argentavis lived,‭ ‬its large size and possibly sedate lifestyle when compared to active predators suggest that it may have been quite long lived.‭ ‬The large size of Argentavis meant that it also had no known predators in the air while most of the ground predators where too small to be a threat.‭ ‬Only the larger phorusrhacids may have been a problem,‭ ‬but still Argentavis had the option of flight,‭ ‬they did not.‭ ‬All of these factors combined has led most palaeontologists to acknowledge the theory that Argentavis was probably a very long lived bird that could have had a lifespan measureable in decades. 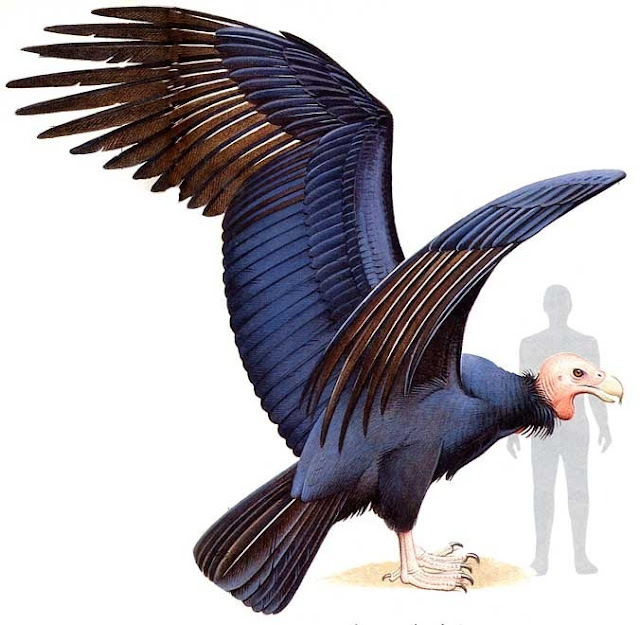 If the above is true then Argentavis may have relied upon what is termed a K-strategy to its life.‭ ‬K-strategy is where an animal species lives at the extent of its ecosystem limit with very little fluctuation in total numbers.‭ ‬This prevents the species from exhausting limited food supplies,‭ ‬and if Argentavis was the scavenger that most people think it was,‭ ‬then its food sources would have been dependent upon the success of other hunters and its own ability to find carrion before other animals had eaten it.‭ ‬The amount of such food would always be changing,‭ ‬but a smaller and stable population of scavengers would have been better able to live of this source than a species that continually overbred. 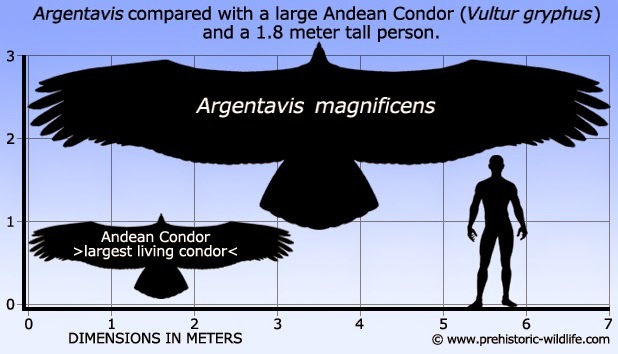 To support the K-strategy Argentavis would have likely invested a lot of time and effort into raising a small number of young that would have stayed with the parent birds for a considerable amount of time.‭ ‬This would have given the young more time to grow strong while greatly reducing the level of infant mortality in the species.‭ ‬This would also help stabilise the population numbers,‭ ‬reducing the risk of overbreeding as the parents would not breed again until a time until the young where at a stage of development where they could survive on their own. 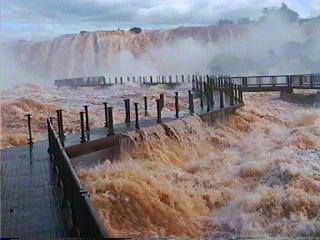 Today, there have been 23 visitors (99 hits) on this page!